Former Mbargo space at Rocketts Landing will become Urban Farmhouse. Founded in 2008, Urban Farmhouse is a coffee shop, farmhouse market and wine cafe, all wrapped into one — with a focus on healthy, local eating. The cafes’ notable environments celebrate bright spaces paired with outdoor seating and eclectic style. Guests can order drinks and food to go or for dining in house, which also includes an ABC on/off license. So, this summer, you’ll be able to grab the perfect bottle of wine and picnic items for your boating adventures from our marina or for your cycling quests on the Virginia Capital Trail. Light fills the cafe in the Urban Farmhouse Shockoe Slip location. Cafe Founder Kathleen Richardson says that the current structure of the 3,000-square-foot space offers a great environment to move into — and is larger than some of their other locations. 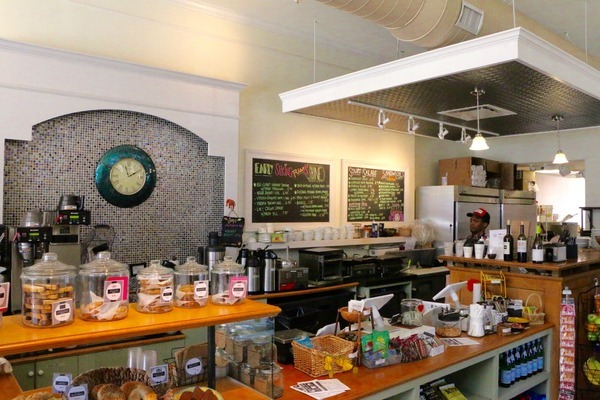 And after looking for a new location for their Church Hill—based cafe, Kathleen found that they have many opportunities to build on their brand and customize the cafe to the local Rocketts Landing community. A market featuring healthy, local food and drinks is a key feature of each Urban Farmhouse location. As they build out the space, they will feature their notable soft-seating area and communal table and also plan to take full advantage of the available patio. And with the tie to the marina at Rocketts Landing, Urban Farmhouse will bring in a boating theme, unique to our community — which aligns with Kathleen’s focus on customizing each cafe to its neighborhood character. an expanded craft beer selection on tap, which is possible with the bar already in place from its former use. an organic craft soda tap featuring Tractor Soda, which Kathleen says will be the first organic soda bar in RVA. a custom omelette bar for weekend brunch, which will take full advantage of the space’s commercial kitchen. People pack the cafe at Urban Farmhouse in Scott's Addition, located in a renovated warehouse. Urban Farmhouse estimates that they’ll need four to eight weeks to customize the space — and they plan to open on May 1. We’ll work closely with them along the way, so stay tuned for further details as we get closer to the opening date. In the meantime, we’re excited for what’s ahead and look forward to having Urban Farmhouse join the Rocketts Landing family.